Wildfire Threatens More Than 1,500 Homes In Northern California : The Two-Way The largest, spreading through the Sierra Nevada forest east of Sacramento, has engulfed more than 18,000 and is only 5 percent contained. 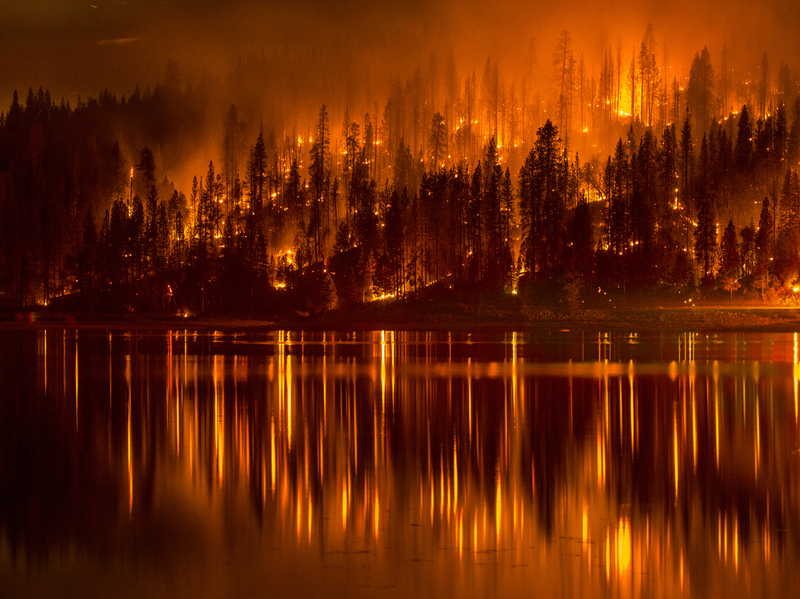 A photo from Sunday shows a wildfire as it approaches the shore of Bass Lake, Calif. Several blazes are being fueled by record drought conditions. The largest of several wildfires in California, the so-called King Fire in the Sierra Nevada forest east of Sacramento, is threatening 1,600 homes as it continues to spread almost unchecked. According to the latest information, the King Fire, one of several that California firefighters are battling, has engulfed more than 18,500 acres and is only 5 percent contained. As recently as Monday, the fire, which started Saturday near the community of Pollock Pines, was one-third its current size. The fire has forced the evacuation of 700 homes. "The advance prompted specially trained federal firefighters to take command of the fire early Tuesday morning. "By nightfall, groups of firefighters were setting off small burns to try to slow the spread, anxious to prevent one flank of the fire from crossing south of Highway 50 from the canyon along the south fork of the American River to the small community that lives in the scenic, heavily wooded area." Elsewhere, Jefferson Public Radio reports: "Fire officials say the destruction in Weed is worse than earlier estimates. Cal Fire public information officer Daniel Berlant says at least 150 homes and structures were burned when a fire ripped through the town Monday afternoon. The Boles Fire reduced entire neighborhoods to smoldering rubble, destroyed two churches, damaged an elementary school and burned portions of the town's largest employer, Roseburg Forest Products Mill." " 'I mean it was devastating,' said Campbell, who was baptized, confirmed and married at the church, along with her children. She also lost her home to the fire.
" 'The house up there is no big deal. It can be rebuilt,' she said. 'But this is my family church, you know? It's much more endearing to me.' "
"In Oakhurst, a foothill community south of Yosemite National Park, a 320-acre fire that damaged or destroyed 71 structures — 37 of them homes — was 50 percent contained. About 600 residents from 200 homes remained evacuated, Madera County sheriff's spokeswoman Erica Stuart said. "More than 4,000 wildfires have burned in California this year." For more on fire conditions in California and across most of the U.S., check out NPR's Fire Forecast app, which is updated daily. The interactive (above) should take you right to Weed, Calif., but you can change the location by entering a new ZIP code or city.